A new addition to the Room Series portfolio, The all-in-one WebEx Room 70 G2 video conferencing system is a new addition to Cisco’s Room Series portfolio, and provides a beefed up version of the current Room 70 system. The Room 70 G2 includes the new and more powerful Cisco WebEx Codec Pro, the successor to the Cisco SX80 integrator codec. 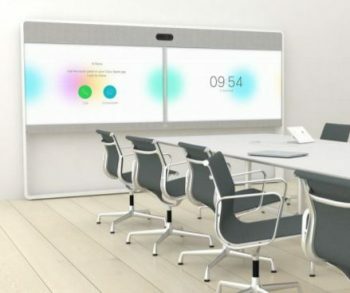 With more inputs and outputs to cover larger rooms and more complex scenarios, an extra screen for content can be added or additional cameras around the room to give more flexibility with presentations and trainers, and more coverage for microphones and viewing for extra-large meeting spaces. The Cisco WebEx Room 70 G2 includes AI and machine learning features with presenter track, intelligent views, noise suppression, voice commands, and people counting technology. The WebEx Room 70 G2 is available with single or dual screens and can be registered on-premise or in the cloud. As a Cisco Premier Partner, with Advanced Video Partner recognition and specialised in Cisco Video Conferencing and Collaboration, VideoCentric is uniquely positioned to successfully deploy, operate and optimise Cisco Video based communication solutions. Relationships & accreditations have always been held at the highest levels possible, and continuing training of both sales, technical & product development, alongside huge investment into up to date demonstration and testing equipment makes VideoCentric one of the UK’s most trusted & knowledgeable integrators of Cisco Video Conferencing & Collaboration equipment. Find out more by getting in touch with our Cisco collaboration specialists today.